This old house is full of English History and we arrived just in time to be taken around in the company of a guide who explained everything in fine detail. The house belongs to the national Trust with the History going back to Tudor times, and is spread over many acres with fine gardens. Also look out for the 16th Century Donkey Wheel that is in working condition that was used to bring water from a deep well. You are also in Red Kite country and we spotted many flying about, these birds are now common in the Chiltern area, also visit Henley-Upon-Thames that is very nearby. The following is taken from Wikipedia for you to read. The name derives from an old connection to the Grey family, descendants of the Norman knight Anchetil de Greye. 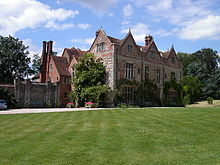 The estate or manor of Rotherfield Greys is referred to in the Domesday Book. The mainly Tudor-style house has a courtyard and gardens. The walled gardens contain old-fashioned roses and wisteria, an ornamental vegetable garden, maze (laid to grass with brick paths, dedicated by Archbishop Robert Runcie on 12 October 1981) and ice house. Within its grounds are the fortified tower built circa 1347, the only remains of the medieval castle, overlooking the gardens and surrounding countryside, as well as a Tudor wheelhouse. The house remains furnished as a family home, with some outstanding 18th-century plasterwork interiors. 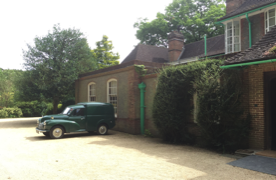 The second part of our trip out took us to the village of Nuffield again in South Oxfordshire close to Henley Upon Thames. The house now belonging to the National Trust was the former home of William Morris and is kept they way he left it from his death in 1963. The following text was taken from Wikipedia. 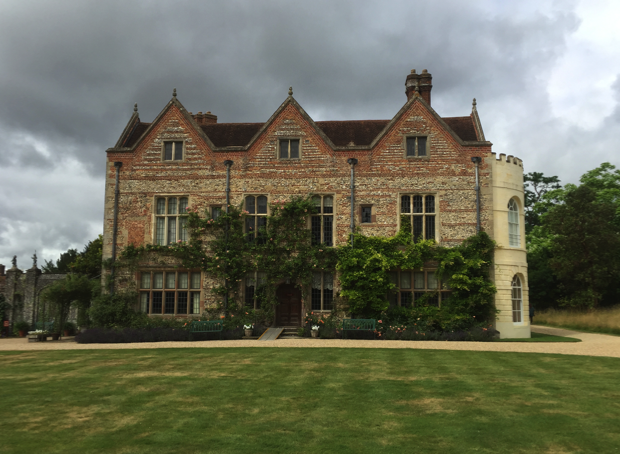 Nuffield Place is country house near the village of Nuffield in the Chiltern Hills in South Oxfordshire, England, just over 4 miles (6 km) east of Wallingford. The house was completed in 1914. William Morris, 1st Viscount Nuffield had it enlarged in 1933 and lived there until his death in 1963. He was buried at Holy Trinity parish church in the village, and bequeathed Nuffield Place and its contents to Nuffield College, Oxford as a museum. The college has gifted the house and part of the estate to the National Trust. Morris was fond of clocks and his bedroom contains eight. His bedroom also has a miniature workshop, in a cupboard, containing a vice and metalworking tools, as well as a jar containing Morris' own preserved appendix. William Richard Morris, 1st Viscount Nuffield GBE CH FRS (10 October 1877 – 22 August 1963), known as Sir William Morris, Bt, between 1929 and 1934 and as The Lord Nuffield between 1934 and 1938, was a British motor manufacturer and philanthropist. He was the founder of Morris Motors Limited and is remembered as the founder of the Nuffield Foundation, the Nuffield Trust and Nuffield College, Oxford. He took his title, Lord Nuffield, from the village of Nuffield, Oxfordshire where he lived. Morris married Elizabeth Anstey on 9 April 1903 — they had no children, and he disbursed a large part of his fortune to charitable causes. In 1937 he gave £50,000 to fund the expansion of the Sea Cadet Corps. In 1937 Lord Nuffield donated £60,000 to Birmingham University for the Nuffield building, to house a cyclotron. In December 1938 he offered to give an iron lung (see Both respirator) made in his factory to any hospital in Britain and the Empire that requested one; over 1700 were distributed. He also founded the Nuffield Foundation in 1943 with an endowment of £10 million in order to advance education and social welfare. He also founded Nuffield College, Oxford. On his death the ownership of his former Oxfordshire home, Nuffield Place and its contents, passed to the Nuffield College who opened it to the public on a limited basis. Although a sale had been mooted, it has now passed to the National Trust and is open to the public on a regular basis. He is also commemorated in the Morris Motors Museum at the Oxford Bus Museum. Morris also has a building named after him at Coventry University, at Guy's Hospital London and a theatre at the University of Southampton. His home in James Street now has a blue plaque. He died in August 1963, aged 85. The baronetcy and two peerages died with him as he was childless. He was cremated, and his ashes lie in Nuffield churchyard, beside his wife's.